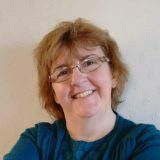 Mairwen Large has been licensed as a reader since 2009 and was appointed to work 16 hours a week as a Children and Families Worker in September 2015. She also works 2 days a week as a primary school teacher. She is married to Simon, the church’s IT bod and has two grown-up. A fluent Welsh-speaking Cardiffian, she met Simon when they were called to the Lee Abbey Community. She loves to tell stories – be it the story of God at work in the Bible or the story of God at work in out lives today; whether the audience is a congregation in church or a group of five year olds. She started her ministry at St Ed’s in 1998 as a keyboard player / worship leader and has gradually worked through the roles, to the place she never thought that she was called – to work with young children and families. Mairwen’s CFW work is very varied. Although we have few children on a Sunday morning there is always provision for them at the 10.45 service, a monthly Messy Church which we call Family@4, a Monday Morning Toddler group, Open the Book school assembly on Tuesday and an array of groups who come to church at regular intervals in the calendar. She is also the first point of contact if you wish to have a child or adult baptised at St Ed’s. To contact her, your best bet is to email at the address above, phone and leave a message, or send a message via the church Facebook page which she also manages.